'Rogue One' Is 'A Star Wars Story' With Fewer Stars And A Lot More Wars A footnote in the Star Wars saga gets its own movie — a tense, grubby, effective tale of interstellar combat that skimps on the series' mythic overtones. 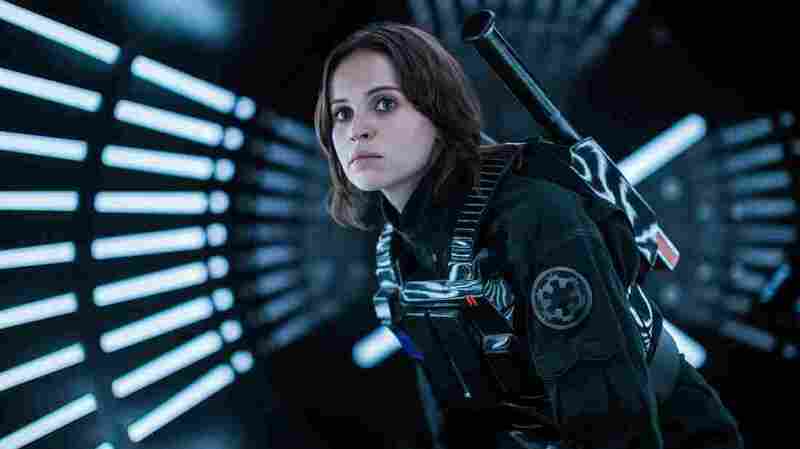 Felicity Jones plays Jyn Erso in Rogue One: A Star Wars Story. The new Rogue One: A Star Wars Story is in point of fact a Star Wars backstory. The eighth Star Wars is chronologically the fourth Star Wars. It is also, shockingly, the first to begin without that portentous John Williams fanfare and title crawl — the moviegoing equivalent of a roller coaster's slow, rickety climb up that first big slope. That's because the entire movie is a title crawl, a dramatic reenactment of everything 1977's Star Wars (retroactively appended Episode IV — A New Hope) packed into three expository yellow sans serif paragraphs that took 70 seconds of screen time to float into the horizon. You remember: Rebel spies have seized the plans for the Death Star, the galactic empire's planet-killing ultimate weapon. At least until they built a second Death Star that proved just as vulnerable as the first. Thirty years after that (last Christmas, in The Force Awakens), they tripled down with the even-more-destructive, just-as-comically explodable "Starkiller Base" — basically Death Star III with a green roof. Anyway: Meet the rebel spies, watch them run, see them get the plans. There may be no more famous MacGuffin in movie history, excepting the Maltese Falcon and Dorothy's ruby slippers. There's your holiday blockbuster. It's a tense, well-made spacefaring war movie about a desperate and demoralized band of insurgents standing up against a rising authoritarian regime. So, you know: Escapist fare. ...not least because it never looks like a screensaver. Director Gareth Edwards, he of the the agreeably scary 2014 Godzilla reboot, recreates the grubby "used future" texture of the movie Lucas cobbled together a long time ago in a filmmaking galaxy far, far away. (Even adjusting for inflation, Rogue One's reported $200 million budget is still five times what Lucas had.) For many of us, just seeing all those old creature designs and starships (and, in one or two cases, human actors) conjured up and expanded so faithfully will be an offer they can't refuse. Of course, Rogue One tries mightily to be more than an appendix. Screenwriters Chris Weitz and Tony Gilroy are old studio hands. (The movie's visual effects supervisor, John Knoll, has a story credit.) In Jyn Urso, they've given the series another resourceful heroine, one who's never made to wear a chainmail bikini. Why Lucasfilm honcho Kathleen Kennedy cast Felicity Jones, an actor who looks remarkably like Daisy Ridley from The Force Awakens, will be the stuff of fan theories. But Jones is good in the role, evincing the wariness of a young person who has been on her own for a long time. Her father (Mads Mikkelsen) was the chief architect of the Death Star, you see, which is why the Rebel Alliance — as represented by the sunken-eyed Diego Luna, whose character is named Cassian Andor — wants to get their hands on her. Rogue One also continues the series' noble tradition of having the Rebel Alliance discuss their secret plans in standing-room-only General Admission mobs of people and aliens, which is maybe not the best way to prevent leaks. With the exception of the desperate first act of The Empire Strikes Back, Rogue One is the first Star Wars that feels like a combat picture. The team of righteous outlaws that coalesces around Jones and Luna is an interesting bunch really does seem like they might have some sins to atone for. Martial arts star Donnie Yen plays a blind bo-staff-weilder who is strong(ish) in the Force; Wen Jiang his more heavily-armed wingman. And Luna's Andor is easy to buy as a revolutionary who understands the moral weight of taking a life, but is still prepared to take many if it will save hundreds or millions. That's something that's never really come across in this pew-pew franchise before. The movie has one other big advantage: Because these characters are, with a few exceptions, previously unknown to us, it isn't a given that they must all survive. The result is the kind of picture the abysmal Suicide Squad aspired to be, wherein people (and droids) who have done questionable things combine their skills of larceny and assassination to serve the greater good. There's a darkness to enterprise that Lucas wouldn't have permitted. When screenwriter Lawrence Kasdan and star Harrison Ford both argued that Han Solo should be killed off in Return of the Jedi, Lucas turned them down flat — no death, no sacrifice, nothing to upset the kids or cut into toy sales, he insisted. Speaking of toys: Sentient droid K2-SO is droll and just a little bit depressed. Performed by Alan Tudyk, he recalls TARS, Bill Irwin's sarcastic ex-Marine robot from Interstellar. That's a good thing. What's less good is the way that even a sidebar Star Wars picture can't escape the gravity of blockbuster expectations. By which I mean it climaxes, like The Phantom Menace before it and Return of the Jedi and The Force Awakens after, with a space battle cross-cut with a ground battle wherein a small force of rebel guerrillas are trying to disable an energy shield protecting the planet/space station/not-a-moon from orbital bombardment. At least it's a cool space battle. But at most, it's a cool space battle. What it doesn't have, what it can't possibly have, is the mythic quality of the franchise's best entries. That's because it's a filling in of blanks, a detail picture. And detail is the enemy of myth.